In the first of a new series on the biggest players in bass Guitar Production, we take a look at Warwick's illustrious history. Warwick's instruments are well respected throughout the world, not just by musicians but by the industry as a whole. Their quality of build and consistency, along with an adventurous R&D ethic, has always kept them in tune with current musical genres but without losing their unique identity. In 1946 Fred Wilfer (descendent of a long line of luthiers) founded Framus (Franconian Musical Instruments Manufacture) in Erlangen in Bavaria using the skill and expertise of the many Schoenbach violin makers displaced by the Second World War. By 1954 Fred had moved his workers into a brand new factory however it became obvious that violins were not the way forward. Guitars were becoming increasingly popular and this led to the introduction of electronics and bass guitars onto the production line. Their first bass guitar design, the slim bodied Star 5/149, was presented at the Frankfurt music trade show in 1956. But it was the bigger Star 5/150 that found favour with British rock 'n' roll players of the fifties like Jet Harris (The Drifters/Shadows), Brian 'Licorice' Locking (The Wildcats) and Heinz Burt (The Tornados) to name just three. This was the time of the post war American Trade Embargo that banned the import of luxury goods from the States so the European manufacturers catered admirably for the demand. Bill Wyman championed the instrument in the sixties and Framus brought out an expanded range of Star Bass guitars thanks to this increase in popularity. However due to the gradual influx of cheap (and generally well made) Japanese world exports Framus were sadly forced into bankruptcy by the end of the 1970s. Enter son, Hans Peter Wilfer who grew up in the Framus factory and learnt all aspects of guitar building along the way. With the dawn of the 1980s came a heightened interest in bass playing so it was the perfect time to introduce something new and exciting so in 1982 Hans Peter became the founder of Warwick, based in Erlangen in the German state of Bavaria. From the outset he was determined to make a high quality instrument and as there was a tremendous demand from bass players for instruments featuring exotic woods and high power electronics this was the obvious route to take. Unusually Warwick adopted to make everything at the factory and brought in raw wood for the necks and bodies including the exotic sounding ovangkol, wenge, zebrano, bubinga, afzalea and tigerstripe ebony. The first production bass models were the Nobby-Meidel, (a curious headless neck-through body bass from designer Norbert Meidel and inspired by the Ned Steinberger headless) and the Streamer, similar to the Spector NS bass of the time and produced under licence until Spector sold out to Kramer Guitars - the Streamer was given a serious make over that included a separate bridge and tailpiece. However the most significant of the early designs was undoubtedly the Thumb Bass, introduced in 1985 and still with us today. This is Warwick at its most magnificent and it put them on the map and has become their most successful design to date. With its ergonomically curved body it positively hugs the player so the two become one. This popularity has led to the Thumb being offered in many variations of 4, 5 and 6-string models, a variety of pickup configurations and electronics, bolt-on necks (Thumb BO) and neck-through (Thumb NT) plus fretted and fretless models in order to provide a bass that suits every desire and many different price platforms. One of their strangest basses is the Buzzard, designed with John Entwistle, and equipped with a long scale neck and two EMG P-type split coil pickups although MEC's were used on the reissue versions. John also used an 8-string Buzzard fitted with Bartonlini electronics. John Deacon also took delivery of a Buzzard but his was a standard 4-string. This is an unwieldy beast by any stretch of the imagination but with its huge beak of a headstock and outrageous body design it's a bass to get you noticed. It's still available today although later models were given a more standard headstock and this improved the balance although at the cost of the looks. One of Warwick's first cost conscious lines was the Fortress Bass introduced in 1994 and offered both active and passive configurations with MEC P/J pickups, a 5-string version with J-style actives and even the Fortress Flashback with MEC lipstick units! In 1995 the plant moved to Markneukirchen and is still there today. With its highly trained craftsmen and new state of the art technology the way was open to really show what the now well established company could do. Much more emphasis was being placed on amplification and electronic variations as well as signature models due to an ever increasing list of endorsees. Along with the highly successful Corvette Warwick began introducing some more varied designs like the Katana with a more conventional curved body shape and with a styled forearm chamfer. The Dolphin has an off-set body and the Vampyre offers a radical restyling of a conventional twin cutaway solid body bass so has mass appeal in the heavy rock and metal field of playing. One of our favourites is the Infinity. With abirdseyeor flamed maple top it's a truly beautiful bass to behold and features a chambered body with f-holes and is a tad lighter as a result. To appeal to the hollow bodied player Warwick released the Alien Acoustic bass with a Florentine cutaway and the unusually shaped soundhole set into the upper body. Its natural sound is clean and bright but plugging it in reveals a much more robust and varied nature. Today all of the top range Warwick designs are produced in Germany but like most companies they have introduced various models at different price levels and have instruments made abroad to make this possible. Whilst some retain the neck-through design many now feature set-necks or bolt-on necks again to keep prices competitive. China produces their popular budget ranged Rock Bass Series (this is a great place to start if you fancy a Warwick bass), their Pro Series models come from Korea and that stunning acoustic bodied Alien bass comes from Vietnam and China. Yet in spite of all the variations and designs on offer two things remain constant and that's the Warwick feel and overall sound. 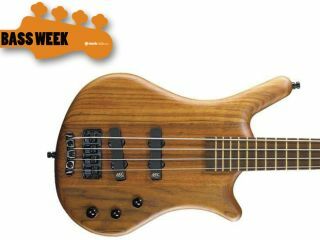 All Warwick basses sit on the body in a particular way that offers a slightly different player/instrument relationship to any other bass and their sound is always clear whether you go for percussive attack or the famous warmth and dirty growl. That's what they do and they do it magnificently. For more on Warwick basses visit the official Warwick website.